Great, but why should you care when the internet is awash with drum samples?In two words, expressive control. 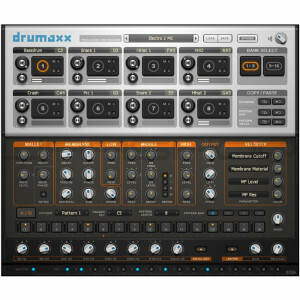 Drumaxx is not based on samples or even commonly used 'synthesis' techniques, where oscillators are mixed and the result is always 'electronic'. At the core of Drumaxx is a model where the vibrating membrane is represented as a mesh of interconnected points. Each point is given physical properties including mass, inertia, stiffness, damping, and all that good physics stuff. For the musician, this means Drumaxx gives you control over multiple parameters such as material, thickness, tension and shape. More importantly, the parameters can be modulated in real-time as a function of velocity or external controls. The drum body is also under user control too, including body material, size, vibration damping, and shape. All this gives you multi-dimensional performance options, a Matrix of variables providing nearly infinite possibilities.